Housekeeping: A quick update on email subscriptions: New subscribers should write to me and I'll add you to the list. Contact me at lorenlivner at gmail dot com. No, that isn't my real name. Now on to one of my favorite subjects, alcohol. We're very cheap drunks in my family, and if a person has more than one beer or one glass of wine, or more than one shot of whiskey, it's a bad sign, a running away from it all, sign. This very light drinking isn't unusual for my culture. The reasons are as old as time: (a) over-indulging makes it hard to get ahead in an already difficult society, and (b) being high, the state of inebriation, impairs one's ability to learn. And we like to learn. That said, the assumption that Jews never let go, or that we're all teetotalers, is wishful thinking. Ours is far from a sober tribe, certainly at this point in time. At any party there are groups within the group working hard to let alcohol take them away. And yet. The rest of us know that relative sobriety comes with advantages far beyond what our heritage suggested. Not only will it help us learn, but embarrassing situations and blurts are less likely sober, there are fewer wasted calories, less of a hit to the pocketbook, and no hangover (unless it is a sugar hangover). The disadvantage is the difficulty empathizing with people who cannot stop drinking until they get high. Therapists, upon hearing the havoc and dysfunction directly related to substance abuse, will advise patients to skip even the first drink. Stay home. Or start with a soft drink and stay with it. Water is better. Abstinence is good! No empathy whatsoever. The thought that abstinence is good is a tough one to buy into. It isn't for everyone. It isn't the only way to control alcohol abuse, either. But it is the best answer for people who can't stop after one or two alcoholic beverages. Behaviorists (like me) believe that to achieve sobriety, to stop endangering one's health and mental health, to stop ruining the lives of others, alcoholics need to do something else. They have to replace drinking. Replace the usual and customary. Nancy Stearns Bercaw is one of those people who can't stop if she starts. Luckily, she's always had this sport, swimming, something to do other than drink. Her memoir is about being a master swimmer, nearly an Olympiad, and trading it in for alcohol. It makes a good story. 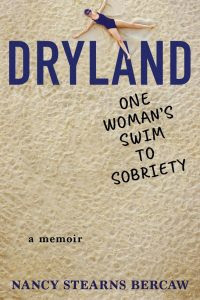 DRYLAND: One Woman's Swim to Sobriety is the female answer to DRY: A Memoir by Augusten Burroughs, if you remember that, probably my favorite memoir of all time. Finally, a pulpy book to recommend to women who know very well that it is time to stop and haven't the will. This might be the one that scares them into it. Even though you know how this one will turn out, you really want to know how she gets there. Nancy Bercaw as a washed up athlete, you wonder, too, if there will be a comeback. The story isn't that much different from those that therapists hear in the office on any given day, or people tell over at Alcoholics Anonymous meetings. We're just waiting for the trauma that kicked off the self-destructive, compulsive behavior, then the subsequent traumas that will keep the compulsion alive, magnify the need to drink, self-medicate. The plots for substance abuse and recovery can be formulaic. Nancy's first trauma, recounted early, is a loss. She competes to be in the Olympics; loses the deciding trial for her race, the one she traditionally wins. Having no place to go, no other plans for a meaningful life, she quits swimming, bombs the pain with booze. Then she joins the Peace Corp, travels the world. Making lemons out of lemonade, Nancy does find meaning, but can't stay dry, even in a literal desert. Dryland is set in several countries, and our voyeuristic peek into these foreign land makes us question our xenophobia, and fear of traveling outside our comfort zones. Question: How does one eat live octopus legs? Answer: With several shots of the local whiskey, before and after. There's even a murder in this book, which takes away the wanderlust, come to think of it. Do you have a close relative who also drinks like this? A relative you might call an alcoholic? For our author, it is her maternal grandmother. The genetics manifest with Nancy's first alcoholic episode, drinking for the first time with girlfriends, as young teens, raiding the liquor cabinet and running naked outdoors. The other girls swear off booze after this, the memory and the hangover enough to deter them. Nancy is just getting started. Her first love, one that even trumps the love of her son and husband, will be alcohol. But you knew that. You wonder when and how the bottom will come, because when a person drinks as much as Nancy Bercaw does, health issues are inevitable; or serious, sometimes fatal accidents; emotional breakdowns, even suicides. And these happen, like the disease, gradually, slowly, and inevitably. GoodReads passed this one onto me, and the publicist, Trish, didn't even know that I'm that woman in the pool at 6 am every day. (Not a real swimmer, only a dozen laps, not a hundred). And that like Nancy, I love watching the kids practice their strokes, splash one another on the weekends. And I love watching FD, his form, the way he glides through the water, a thing of beauty. We're not in it for speed at our age, but nobody said we can't try. We watch the Olympics together and realize how incredibly far we are from "real" swimmers. Those kids who made it there are surely making their parents proud. But nothing makes a parent more proud than a kid who fights that battle against addiction, and wins. Nancy, just want you to know. People like me, reading your story? Really proud of you.